A microtiter plate was coated overnight with various antigens at a concentration of 5 μg/ml. After washing and blocking with PBST+5% BSA, Human Anti-Adalimumab Antibody, clone AbD18654 (HCA202) was added at a concentration of 2 μg/ml. Detection was performed using Mouse Anti-Penta Histidine Tag:HRP Antibody (MCA5995P) in HISPEC Assay Diluent (BUF049A) and QuantaBlu Fluorogenic Peroxidase Substrate. A microtiter plate was coated overnight with Recombinant Human TNFα (PHP051) at a concentration of 1 µg/ml. After washing and blocking with PBST+5% BSA, a pre-incubated mixture of adalimumab (0.3 μg/ml) plus increasing concentrations of Human Anti-Adalimumab Antibody, clone AbD18654 (HCA202) was added. 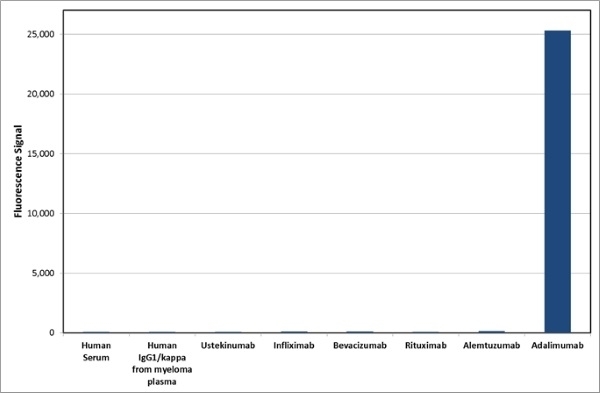 Free adalimumab, still capable of binding to the Human TNFα coated plate was detected using Goat Anti-Human IgG F(ab')2:HRP (STAR126P) and QuantaBlu Fluorogenic Peroxidase Substrate. Data are shown as the mean of three measurements. A microtiter plate was coated overnight with Human Anti-Adalimumab Antibody, AbD18654 (HCA202) at a concentration of 1 µg/ml. 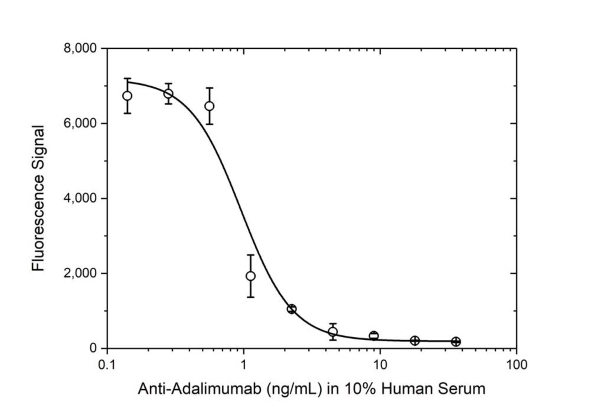 After washing and blocking with PBST+5% BSA, 10% Human Serum was added spiked with increasing concentrations of adalimumab. Detection was performed using Human Anti-Adalimumab:HRP Antibody, clone AbD18655_hIgG1 (HCA204P) at a concentration of 2 µg/ml in HISPEC Assay Diluent (BUF049A) and QuantaBlu Fluorogenic Peroxidase Substrate. Data are shown as the mean of three measurements. A microtiter plate was coated overnight with adalimumab (black), infliximab (red), alemtuzumab (green), human IgG1/kappa (blue), BSA (light blue) at a concentration of 5 μg/ml. After washing and blocking with PBST+5% BSA, Human Anti-Adalimumab Antibody, clone AbD18654 (HCA202) was added . Detection was performed using Mouse Anti-Penta Histidine Tag:HRP Antibody (MCA5995P) in HISPEC Assay Diluent (BUF049A) and QuantaBlu Fluorogenic Peroxidase Substrate. Anti-adalimumab antibody is a recombinant, neutralizing anti-idiotypic antibody in monovalent Fab format; it is ideal for bioanalytical assay development to measure levels of adalimumab or biosimilars. It is recommended as capture antibody in PK bridging ELISA with HCA204/HCA204P. 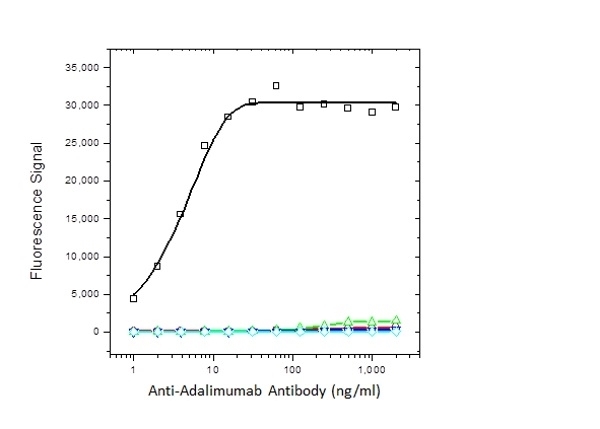 Human Anti-Adalimumab Antibody, clone AbD18654, is a high affinity anti-idiotypic antibody that specifically recognizes the monoclonal antibody drug adalimumab and inhibits binding to its target, TNFα. 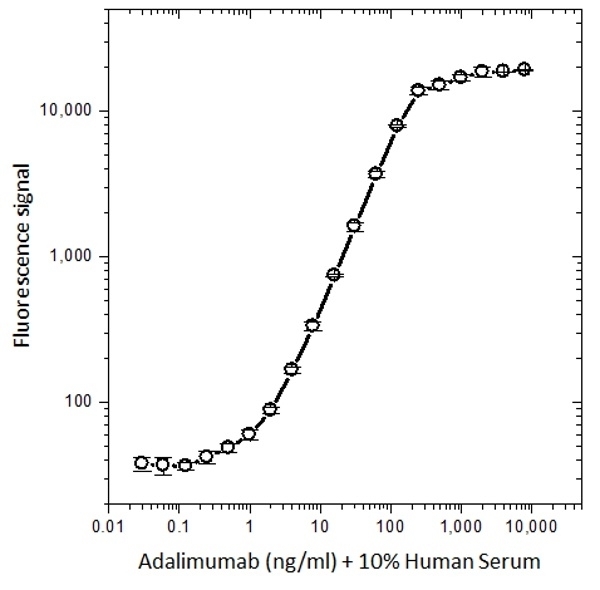 The antibody can be used to measure the levels of adalimumab and biosimilar products in bioanalytical assays. Clone AbD18654 is recommended as a capture antibody in a pharmacokinetic (PK) bridging assay when used in combination with HRP-conjugated detection antibody (HCA204P). The assay will measure free drug, as both antibodies are inhibitory. This product may be used in an indirect ELISA or in an ELISA bridging assay as a capture antibody together with HCA204P as the detection reagent.